Tricks are fun for both you and your puppy. Never teach anything that is demeaning or dangerous. It is especially important not to teach puppies to jump until they are 18 months old to avoid damaging their rapidly growing bones and joints. Hold a tasty treat next to your puppy’s nose, and move your hand so that he turns his head. Give him time to adjust to this position, then slowly move your hand further round until he begins to roll onto his side. Feed the treat and praise him when he is on his side. Gradually, you can ask for more until he rolls onto his back. Make sure he feels secure and place something soft underneath him before asking him to do this. Hold a treat tightly between your fingers and place your hand low so your puppy will find it easy to use his paw to help him get the treat. As soon as he lifts his paw, release the treat and praise well. Practice over several sessions until he paws at your hand every time you present it. Then gradually begin to raise your hand higher. Introduce the voice cue by asking him to ‘wave’ as you present your hand. Gradually, over several sessions, raise the hand with the treat higher, only rewarding when he paws at your hand. Eventually, hold your hand just out of reach and ask for a ‘wave’. Be patient and ignore any other behaviour (help him if you need to by lowering your hand a little). Reward as soon as he ‘waves’ and gradually raise your hand higher until he will ‘wave’ when you ask when your hand is high above him. When we teach our dogs to respond to a signal, they learn a whole set of associations surrounding the training event, rather than just the voice cue or hand signal we were trying to teach. So you will need to teach the same exercise in different places with different associations and, with him in a different position relative to you, until he learns what the signal really means. Position your puppy so that you are standing in front of him in a narrow corridor. Get his attention, show him the hand signal for ‘back’ and say the word, while at the same time stepping slowly towards him. He will have no choice but to step back and you can praise and reward him. Continue, slowly asking for more steps as he learns, and gradually reducing your movement forward. Once he understands, try again in open areas. Teach your dog to touch a target (e.g. the end of a ruler) with his nose by holding it out in front of him and rewarding immediately with praise and a titbit when he sniffs at it. Continue until he realises what is required and will move to touch the end of the target as soon as he sees it. 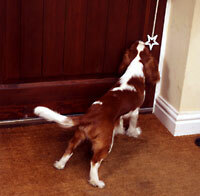 Then put the target against an open door at your dog’s nose height. Encourage him to touch the target with his nose and reward well when he does. Gradually ask for harder pushes of his nose against the door until he is closing the door, then remove the target and repeat. Make sure you have trained each part of this trick well before moving on to the next stage, and praise him well and reward him with a tasty titbit whenever he does what you have asked. Make it fun and keep him excited and active so he learns quickly. 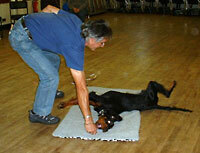 For more information on how to train tricks, please see the book ‘Puppy School’.